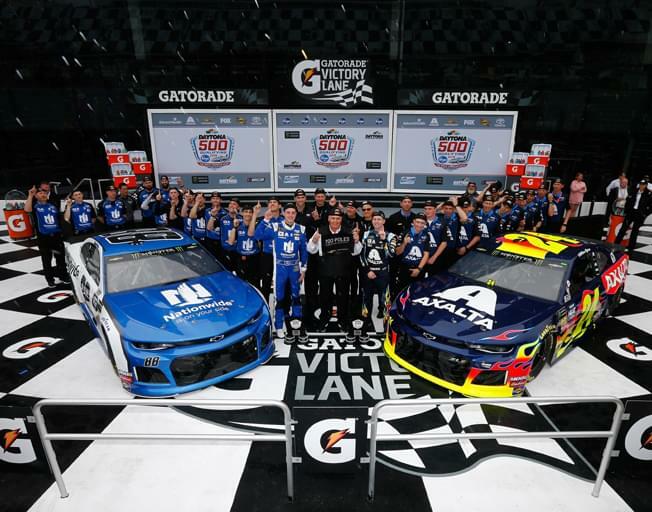 It’s a familiar site to start the 2019 Monster Energy NASCAR Cup Series season with an all Hendricks Motorsports front row for the Daytona 500. Qualifying rounds that determined the front row for the year’s biggest race in NASCAR and the start of the new season were held over the weekend. While drivers, teams and crew chiefs may have been shuffled a few times in recent years … the outcome of the front row qualifying was very familiar. For the first year in a row it is a Hendricks Motorsports team that won the pole position for the start of the Daytona 500. Equally familiar is the other spot in the front row will be filled by a second Hendricks Motorsports car. Longtime crew chief of the #48 Chevrolet Chad Knaus was moved to the #24 Chevrolet for this season. That new pairing of Chad with sophomore NASCAR Cup Series driver William Byron is already paying off as that is the team that earned the pole for the Daytona 500. Alex Bowman will start next to his teammate driving his #88 Chevrolet. The other two Hendrick Motorsports drivers (Jimmie Johnson in the #48 Chevrolet and Chase Elliot in the #9 Chevrolet) earned the third and fourth seeds for the Daytona Duels that set the rest of the starting grid for the Daytona 500. The Gander RV Duels at Daytona take place Thursday, February 14th. The 2019 Daytona 500 takes place at Daytona International Speedway Sunday, February 17th.